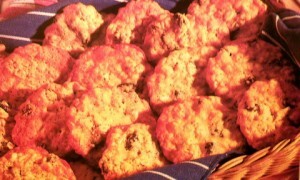 These classic cookies are loaded with oats and raisins and they are so quick and easy to make. Taste wonderful with a cold glass of milk or, my favorite, a hot cup of coffee! 1. Preheat oven to 350 degrees F. Grease 3 baking sheets. In a medium bowl, combine the flour, baking powder and salt. 2. In a large bowl, beat the brown sugar and butter on high speed of mixer until light and fluffy. Beat in the eggs and vanilla until smooth. 3. With a wooden spoon, gradually stir in the flour mixture until thoroughly combined; stir in the oats and raisins until blended. 4. Drop the dough by rounded teaspoonfuls 1-1/2-inches apart on prepared baking sheets; flatten slightly with a fork. Bake until golden brown, about 12 minutes. Cool on baking sheets for 2 minutes; transfer to wire racks to cool completely. Makes 32 cookies.